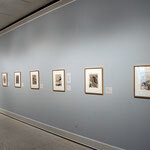 This exhibition is comprised of 65 early etchings by the Russian-French artist Marc Chagall (1887-1985) that he produced in Paris for the art dealer and publisher Ambroise Vollard. 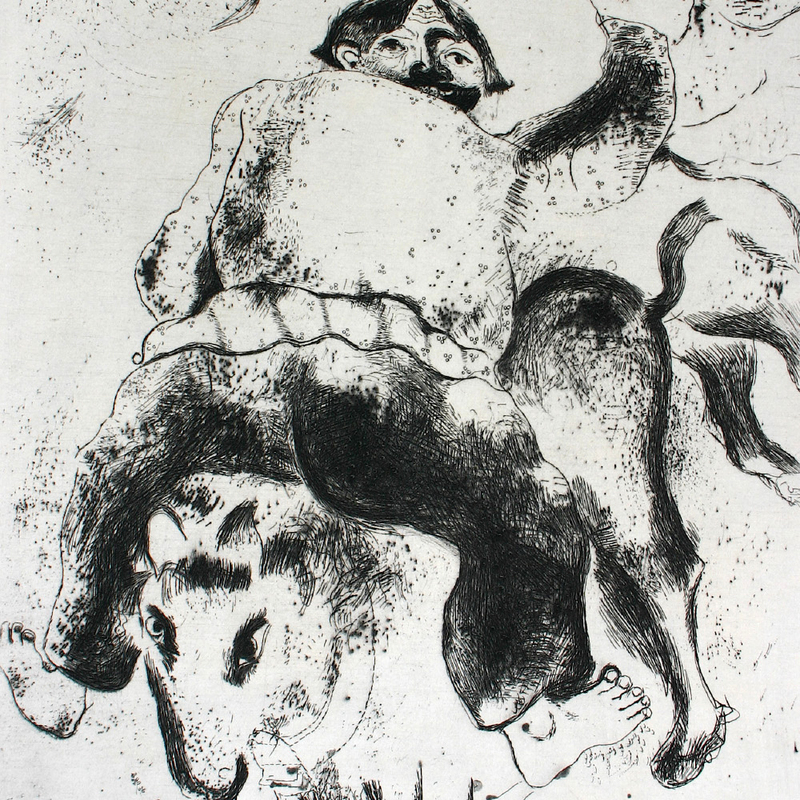 Chagall’s first commission came from Vollard in 1923 to illustrate Russian village life and traditions. 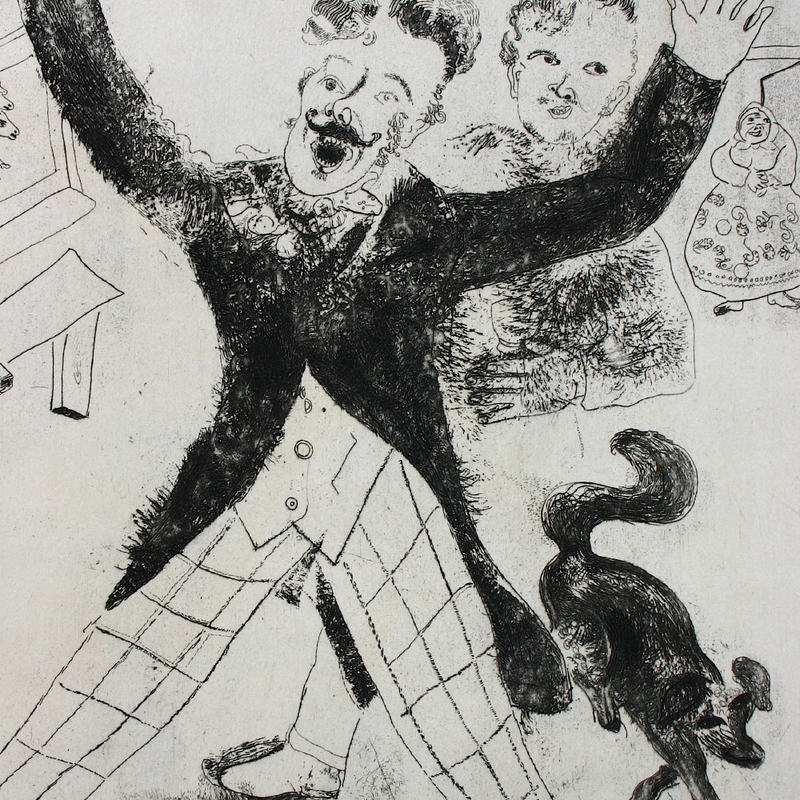 In making the series, Chagall choose to illustrate the stories told in Nikolai Gogol’s popular nineteenth century novel Les Ames Morts (The Dead Souls). It was Gogol’s masterpiece and considered a classic tale of Russian literature. The novel was published in the nineteenth century under the title The Adventures of Chichikov, which softened the original title referencing Serfdom-ism. 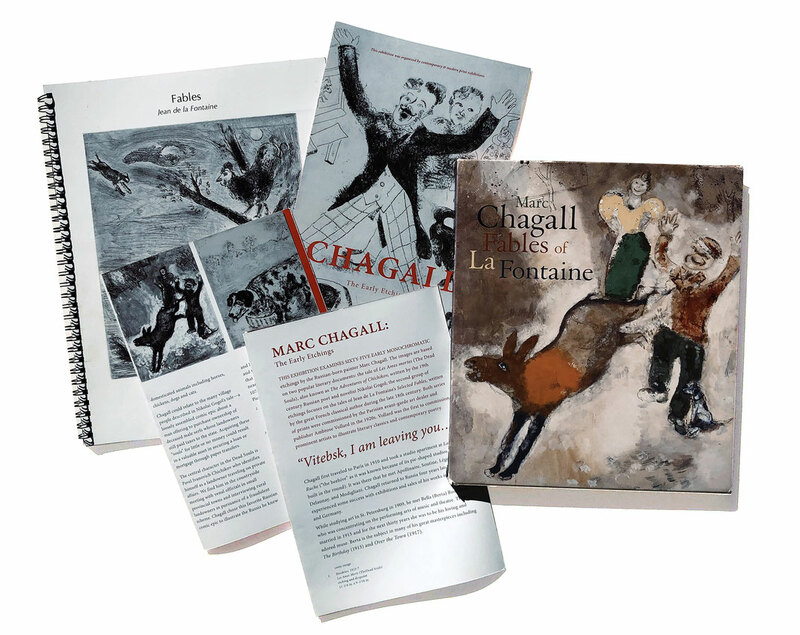 It was Chagall's desire, as he told Vollard, to illustrate images that depicted what he knew best—Russian village life. 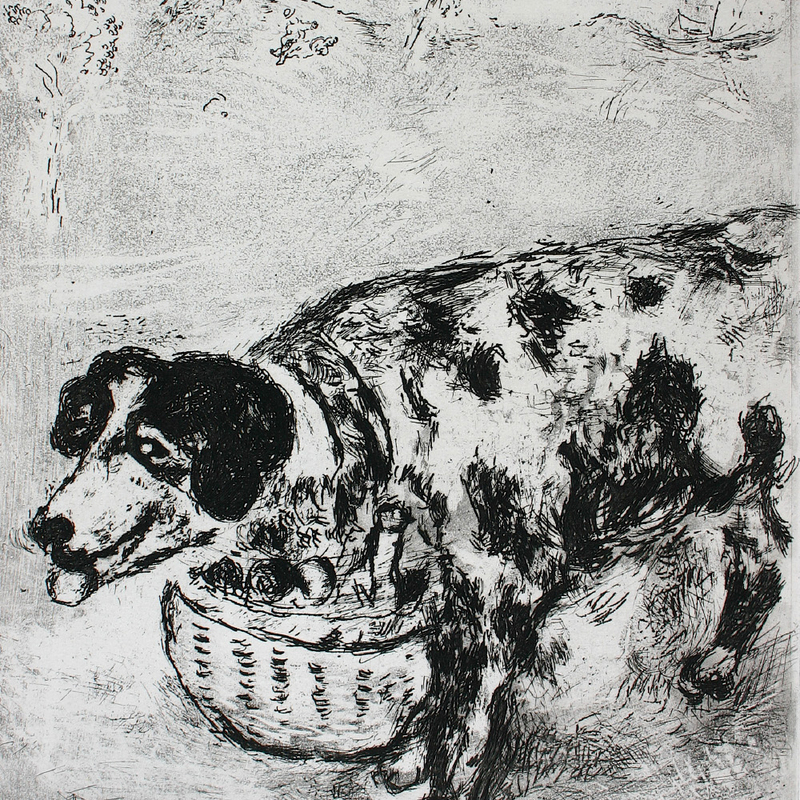 Vollard was most pleased with the series of plates that Chagall had produced and immediately ask him to create a second series on the Fables of Jean de La Fontaine. This second series was begun in 1927 and completed within two years. The commission caused some controversy among the French literary circles, suggesting that a Russian artist had no business illustrating a revered French poet’s fabled narratives. The dealer defended his position by pointing out that the fables were not uniquely French, but Greek in origin. In fact, they originated in the ancient writings of the Greeks and later among Latin poets before La Fontaine translated the verses into children's stories. 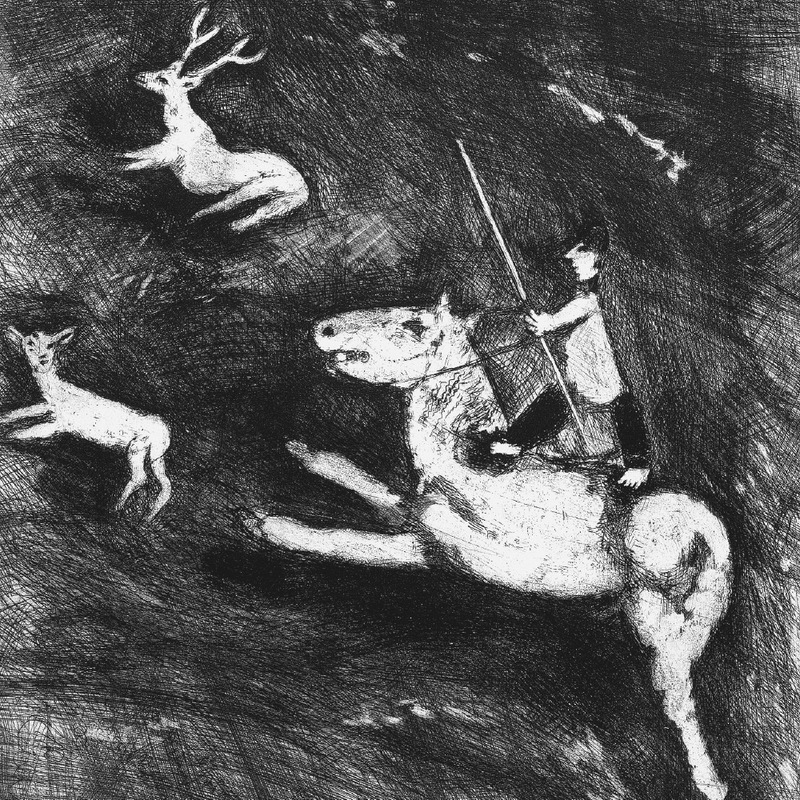 Vollard died before the two series of etching plates could be printed. Twenty years later, the Greek born publisher Avec Tériade (Efstratios Eleftheriades), who had founded Tériade in Paris, acquired the plates and had them printed in 1948. 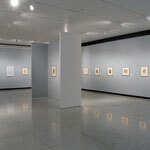 Four (4) will include the sixty-five (65) framed works of art (etchings and aquatints), and one (1) crate will include 3 wall panels. Crates measure [H/L/W] 31 x 36 x 2, 34 x 36 x 27, 29 x 31 x 26, 31 x 29 x 24 and 38 x 26 x 10. 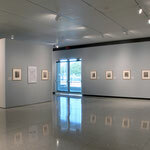 65 etchings by Marc Chagall produced between 1923 and 1930 commissioned by the Parisian art dealer Ambroise Vollard. 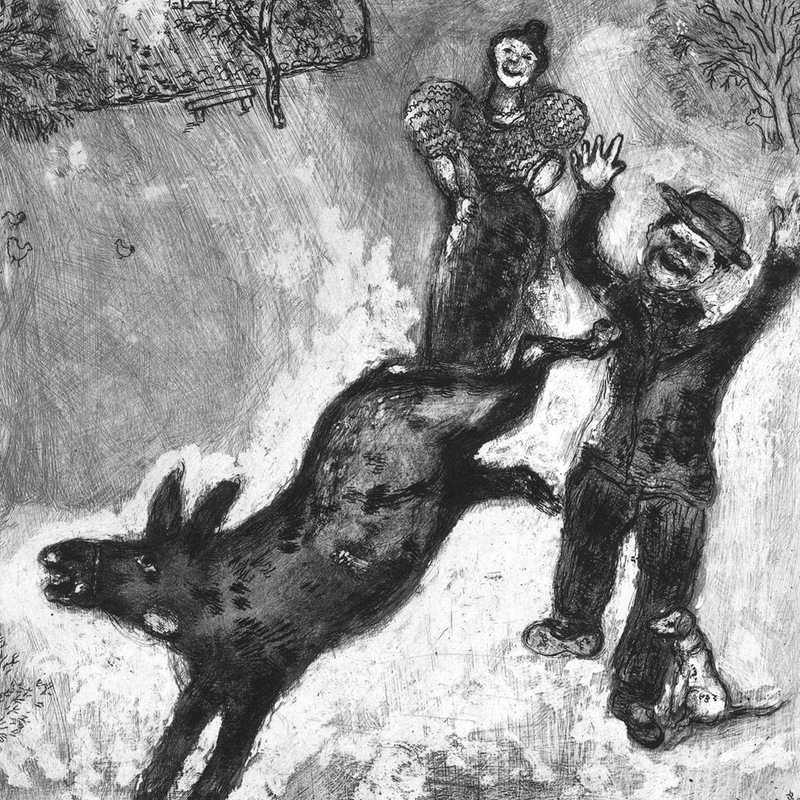 The etchings are based on the novel Les Ames mortes (The Dead Souls) by the Great Russian novelist Nikoli Gogol (1809-1852) and the Fables poems by the French lyricist Jean La Fontaine (1621-1695). All of the prints are framed with a quality small leaf design 24 kt. gold frame (3/4 in. wide with thin red inside trim) and each measures (h x w) 21 x 19 inches. All works are protected with UV-3 plexi. 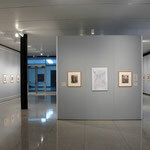 Panel text addresses the historical and artistic content of the etchings (text copy attached). 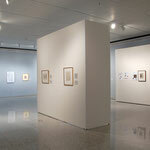 CMPE does not provide the entry wall text with title and dates of the exhibition, sponsor names or other credits. The borrowing institution must include credit to CMPE as organizer of the exhibition as stated in the Application/Agreement terms. 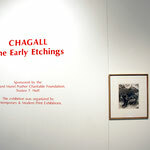 One Thousand (1,000) Printed Gallery Guides CHAGALL: The Early Etchings published by Contemporary and Modern Print Exhibitions. Didactic Wall Labels printed and mounted on tan beveled edge board. 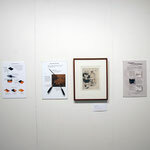 [CD format] with scanned images, bio and chronologies related to the artist and poets. Press information includes follow-up press release information related to specific topics. with suggested essay material and “in-class” questions (can be used for docent training as well). 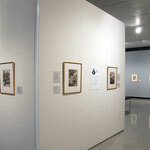 CMPE will provide a CD format to the museum for educator use and distribution. condition reports, box list and insurance liability protection for borrowing institution [letter form issued by AXA Art Insurance re. Willis Insurance Services/Los Angeles].